See the Greatest Story Ever Told in a way you have never seen before. The Great Passion Play has been telling the inspiring story of Christ’s life and death in a monumental way since the 1960’s. With more than 150 actors and live animals on a small village-sized set, visitors become active observers of Jesus Christ’s life, betrayal, death, and glorious resurrection. Whether it is the impressive set or the subject matter, the Great Passion Play in Eureka Springs is “America’s #1 Attended Outdoor Drama” with nearly 8 million visitors. The Passion Play opens in May! The Christ of the Ozarks is a popular place for photos. It and the many other attractions at the Great Passion Play make it a destination for millions of people. Photo courtesy of the Crescent Hotel. Walk through gate to Jerusalem and tour the Holy Land set in biblical times. Self-guided tours through the Holy Land take visitors through full-scale replicas of the Eastern Gate in Jerusalem, the Tabernacle and more. View one of the most extensive collections of Christ-centered art in the Sacred Arts Center. Works range from the 9th century to present day. View over 7,000 bibles in 625 different languages. Ancient parchments, an original King James Bible from 1611 and a page from the Gutenberg Bible are some of what is on display. At 67 feet high with an arm span of 65 feet, the Christ of the Ozarks stands overlooking the mountain village of Eureka Springs. 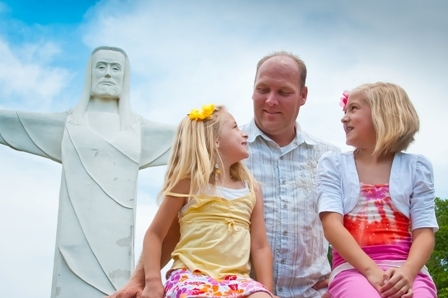 Christ of the Ozarks is a favorite for family photos, group photos and weddings. Buy Great Passion Play tickets online now! Plan your trip to Eureka Springs. See group accommodations and last minute deals. This entry was posted on April 14, 2014 by estcblog in Attractions, Crescent Hotel, Road trips, Things to Do and tagged Eureka Springs, Passion Play, photography.